Stop-loss orders are a protective measure used to limit the trader’s capital exposure, thus setting up a pre-determined amount of maximum losses that can be incurred. Stop-loss orders are considered a vital tool when a trader cannot continuously monitor his trade position for some reason, but wants to remain on the market. However, stop-loss orders are only useful when the market moves in the undesired direction, in other words they can limit our losses, but they can’t protect our gains. Here is where the trailing stop comes in. Trailing stops are a stop order which protects our profits. It can be set at a defined percentage or absolute number of pips away from the current market price. Trailing stops are designed to protect gains by allowing the trade to remain up as long as the price keeps moving in the desired direction, while closing the trade if the market reverses and moves in the wrong direction by a defined percentage/absolute number of pips. For example, in a bull trend, each time the market scores a new high, the trailing stop will be moved up (it will trail the price as it goes in the desired direction), maintaining the percentage/pip distance we have selected. If the price then reverses, the trailing stop will hold the last position until it is hit, or will trail higher, if the market scores a higher high again. A key difference between stop-loss orders and trailing stop orders is that the latter works with the client terminal, while stop-loss orders are placed with the server. This means that you trailing stop order will be lost, if you close your terminal, thus leaving your trade unprotected. The stop-loss order, however, is maintained by the server and remains in force, even if you close the trading platform. Placing a trailing stop is done by selecting the order you want to protect in the Terminal window, right-clicking on it to bring up the context menu and scrolling over the Trailing Stop button. The pop-up window allows you to select a predetermined pip distance to the current market price, or you can specify one by clicking on the Custom… button. Only one trailing stop can be set for a single position. Here is a screenshot of the menu. Once the trailing stop order has been placed, the terminal will monitor the price to see if the position becomes profitable. As soon as the profit in points becomes equal or exceeds the specified level, it will place the stop-loss at breakeven automatically. From there, if the price continues to move in the desired direction, the trailing stop will automatically adjust, according to each new high. However, if the price reverses and goes in the undesired direction, the trailing stop will hold unchanged until it gets hit, thus protecting your previous gains. Removing the trailing stop is done by selecting the None command in the Trailing Stop managing menu. 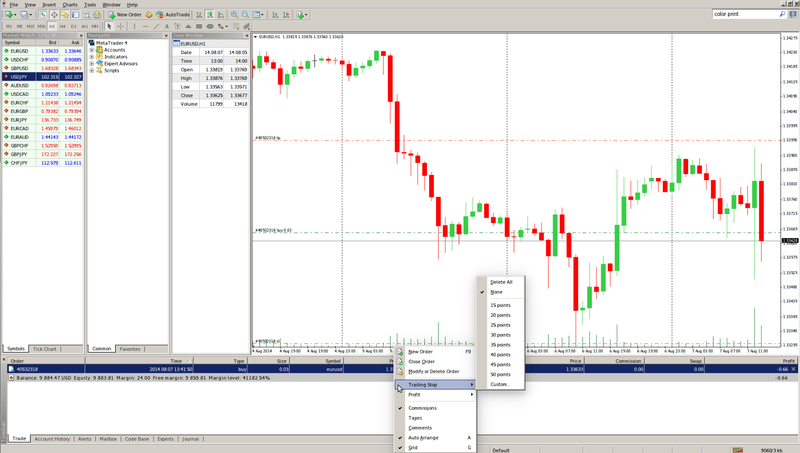 By clicking Delete All you will remove the trailing stops of all your open positions and pending orders.